The skin was kept simple with M·A·C STUDIO FINISH SPF 35 CONCEALER buffed into the face to invisibly perfect, swept with PREP + PRIME TRANSPARENT FINISHING POWDER to polish and set. M·A·C BRUSHSTROKE LINER in BRUSHBLACK used to create a bold, graphic-winged eye liner through the lash line to elongate and extend the eye. 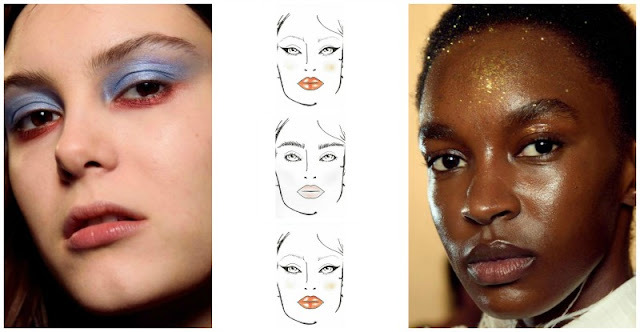 A selection of models received hues of GLITTER and REFLECTS GLITTER over the eyelids for a multidimensional highlight on skin. Colorful hues were swept over the eyes, using vibrant shades such as M·A·C PIGMENT in CHARTREUSE and FUCHSIA. Big lashes for big liner: The 12 LASH applied to the upper lash line for a dramatic, lush emphasis to lashes, followed with the7 LASH customized for the lower lash line. 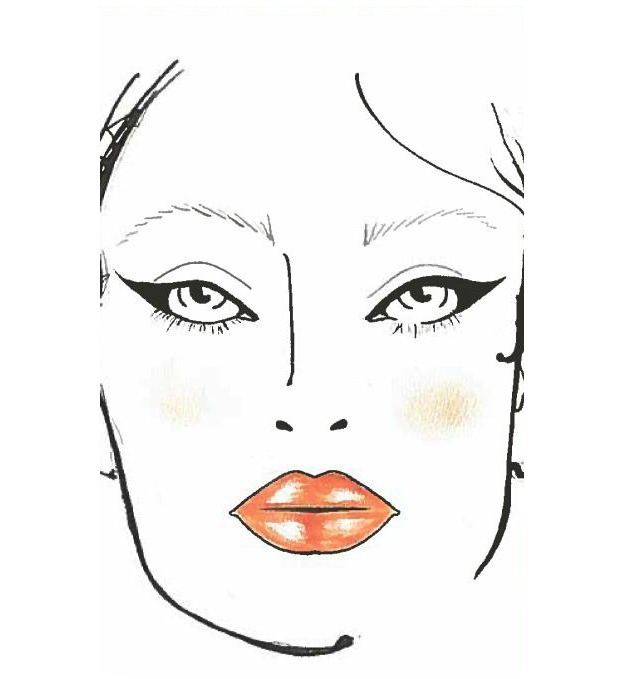 LIPSTICKS in MORANGE and RAVISHING were mixed together and applied for a strong, coral red on lips to finish. 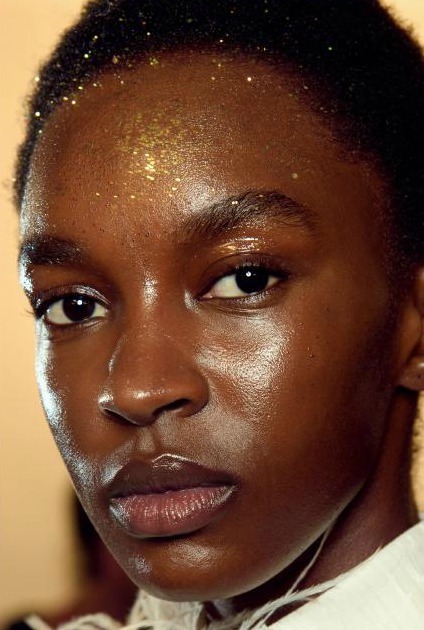 The skin was made to look luminous, young, fresh and flawless using STROBE CREAM in PINKLITE and M·A·C STUDIO WATERWEIGHT CONCEALER to even and perfect. PRO LONGWEAR PAINT POT in GROUNDWORK applied for a touch of contour. MIXING MEDIUM SHINE mixed with OH, SWEETIE LIQUID LIPCOLOUR in FUNFETTI CAKE (AVAILABLE SUMMER 2018) applied over the high planes of cheekbones, bridge of nose, center of the eyelid and Cupid’s bow to highlight. MINERALIZE BLUSH in BUBBLES, PLEASE (AVAILABLE SPRING 2018) blended low on the cheek. PIGMENT in WHITE applied in the corner of the eye for a soft pearl highlight. 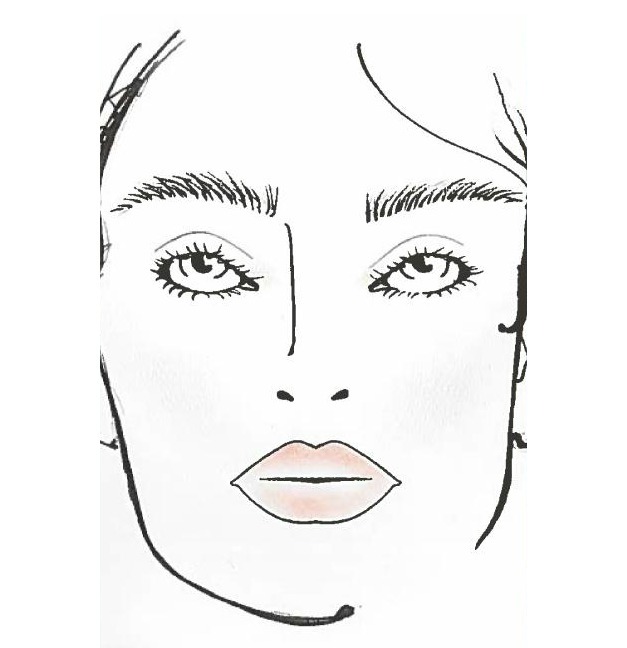 GREAT BROWS used with care to create a big, fluffy and boyish look to brows. M·A·C TREND FORECAST FALL18/LIP IN DEMURE-ISH and FENNEL (AVAILABLE SPRING 2018) mixed and applied for a soft lip to finish. M·A·C STUDIO FINISH SPF 35 CONCEALER melted into the skin using fingers to even and perfect, topped with a light dusting of M·A·C STUDIO FIX POWDER PLUS FOUNDATION for a diffused, fresh, matte finish to skin, using the 135 SYNTHETIC LARGE FLAT POWDER BRUSH to apply. To create the 70s “Disco Inferno” vibe, M·A·C PIGMENTS were swiped across the eyelid using fingers for a “real” woman effect. 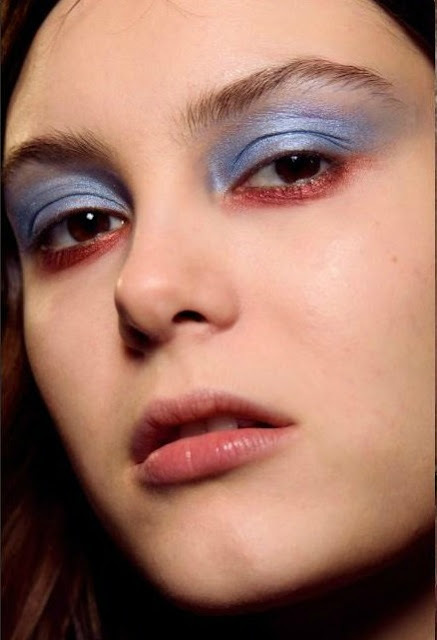 A complementary color swiped under eyes across the lash line using a 239 SYNTHETIC EYE SHADER BRUSH to create the authentic 70s rock ’n’ roll queen look. LIP SCRUBTIOUS in SWEET VANILLA used to gently exfoliate the lip, followed with LIP CONDITIONER (TUBE) to replenish and blotted with tissue to eliminate any excess shine to finish. The girls have just emerged from the water having been diving for oysters – perfected skin with a wet, dewy finish, then GLITTERS in IRIDESCENT WHITE (AVAILABLE SPRING 2018) and REFLECTS PEARL blown on for a glacial finish: PREP + PRIME FIX+ and M·A·C STUDIO MOISTURE CREAM applied to instantly nourish and replenish the skin. FAST RESPONSE EYE CREAM applied to eye area to awaken and smooth. M·A·C STUDIO WATERWEIGHT SPF 30 FOUNDATION applied as needed to even and tone. 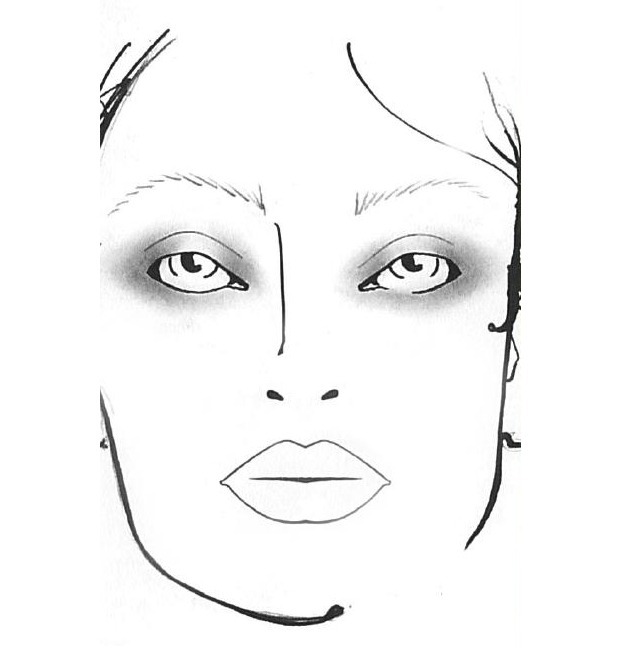 MIXING MEDIUM SHINE applied in a light veil over perfected skin, concentrated on the center of the forehead. The mixture of GLITTERS in IRIDESCENT WHITE (AVAILABLE SPRING 2018) and REFLECTS PEARL was blown aiming for the forehead into the hairline, allowing the fallen particles to cascade down onto the cheekbones, creating a glacial iridescence on skin. The brows were perfected if needed and brushed through with BROW SET in CLEAR to naturally groom. The lashes were well curled and left clean of mascara. LIP CONDITIONER (TUBE) lightly applied as needed to replenish the lip. M·A·C STUDIO WATERWEIGHT CONCEALER sparingly applied over the face as needed to even and perfect. CHROMAGRAPHIC PENCIL in BLACK BLACK blended on the eyelid and through the outer corner of the eye in a “V” shape to beautifully extend. PRO LONGWEAR FLUIDLINE in BLACKTRACK applied as an imperceptible liner through the upper lashes to invisibly define. MIXING MEDIUM SHINE applied on the eyelids to add dimension and give a “lived-in” finish to skin. EXTENDED PLAY LASH MASCARA in ENDLESSLY BLACK added to the roots of the upper lashes for a bit of accentuation and lift to the eye. PREP + PRIME LIP applied to hydrate and smooth the lip to finish. All MAC products, except where noted, are available online and in-store.